First time students are invited for a taste, a glimpse of yoga, your first class is free! Drop ins are available as space permits. $18 per class. Call ahead to confirm space. A 10 class punch card is now available $160.00 for those who need more flexibility. There is an expiry date! Punch Cards are not refundable! Students registering for an entire session have a reserved place in the class and receive the best class fee of $14.00. Session fees are not refundable once the session has begun. To find the fee for the session, Please click the day and time on the schedule/calendar to find the total fee. Makeups for missed classes are possible as space permits. There is an additional 10% discount when registering for two or more classes per week. Private sessions are also available by Appointment. Cost is $75 per hour session or $250 for 4 sessions. What happens in Iyengar Yoga Classes? All our yoga classes are 90 minutes in length and no two classes are identical. 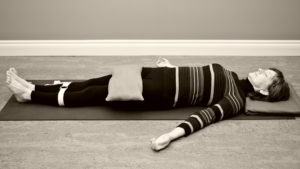 Supine poses to develop Breath awareness and deep relaxation. Back extensions keep the spine youthful and lift our spirits. This is a course that goes beyond the regular class work. It is a class for students who are interested in developing a home practice and taking yoga into their life. Each 3 hour class includes an asana theme as well as exploring the other Eight limbs of Ashtanga Yoga. A commitment of at least one regular class per week for the year is required, to provide the student with continuity and support. Saturday dates for 2018- 2019. 9am – 12pm. September 22, October 20, November 17, December 15, January 19, 2019, February 16, March 23, and April 27. If you are interested Contact Marilyn for an application form. Level 1 is a class recommended for beginners or those content to continue to work on mobility, stability and strength on the introductory syllabus. Level 2 is a class for students ready to work with inversions and deeper work. It is highly recommended that students are beginning a regular home practice. Level 3 is a challenging class for more experienced students ready to refine the art of yoga even further. There is regular work with inversions, balancings, twists as well as forward and back extensions. It is expected that students have a regular home practice. Teachers approval is required to attend this class. Multi Level classes are designed around the needs of the students attending. Options for the various levels will be provided so all students are both challenged and safe. The Gentle class is a class for people needing a less intense class, those recovering from an injury or illness. We gently open the joints of the body using props as needed. A whole array of props such as blankets, mats, bolsters, straps, chairs and blocks could be used to modify poses as required. It is important to discuss any concerns with your teacher prior to class. Restorative/Pranayama is a multilevel class focusing on supine poses and breathing techniques. Pranayama is translated as breath control. In the Iyengar method this is approached with care when the students have some capacity for asana, the postures. Starting Spring 2015 one day a week will be devoted to this work. The class will be on a different day each week. Please check the calendar for details.